Janet Yellen's nomination as next chair of the Federal Reserve may bring some relief for investors Wednesday, after concerns about the looming debt ceiling crisis led to two days of selling. U.S. stock futures were modestly higher ahead of the opening bell. Yellen is expected to be nominated by President Obama at 3 p.m. ET. She has long been a favored candidate for the position and shares much of current chairman Ben Bernanke's thinking on loose monetary policy. "News that Obama is set to nominate the dovish vice-chair Janet Yellen to the top job at the Fed has seen sentiment improve, based on the prospect of policy continuity," wrote Mike van Dulken, head of research at Accendo Markets, in his daily note to clients. "It's expected that rates will stay low for longer and policy will be accommodative." An hour before the Yellen announcement, investors will get a look at the minutes of the Federal Reserve's most recent policy meeting. The document will be closely scrutinized for clues about the central bank's plans for its bond-buying program. Earnings rolling in: Alcoa (AA) shares rose nearly 4% in premarket trading after the aluminum producer's earnings beat expectations. Shares of Yum! Brands (YUM), meanwhile, plunged more than 7% after the operator of KFC, Taco Bell and Pizza Hut reported weak earnings and continued problems in its China division. Costco (COST) missed on revenue and reported a slight bump in same store sales. Earnings per shares came in better than expected. Retailer Family Dollar (FDO) beat earnings forecasts, while revenue was roughly in line with estimates. 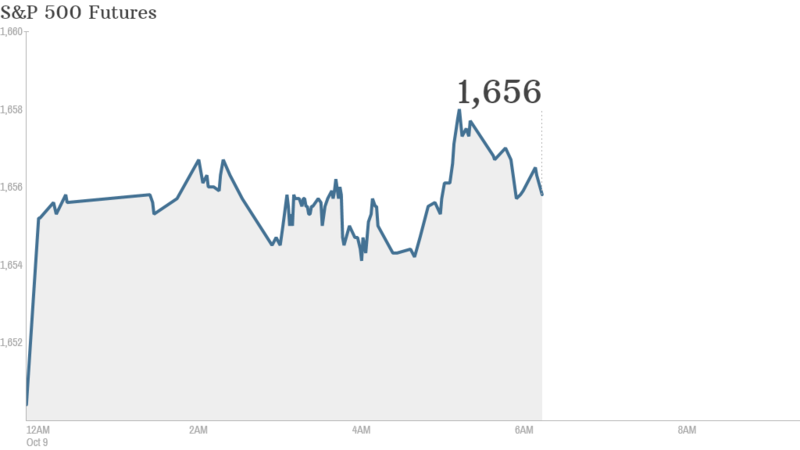 Debt anxiety: U.S. stocks fell Tuesday amid continued anxiety over the debt ceiling crisis. The Nasdaq sustained the biggest hit, with major tech stocks taking a dive. The Dow Jones industrial has dropped 353 points since the partial shutdown of the federal government began on Oct. 1. Investors and traders are getting more concerned by the day that Washington will not raise the debt ceiling next week. This could lead the government unable to pay all of its bills on time. The yield on one-month Treasury bills surged to its highest level since the financial crisis Tuesday as investors worry about the country's ability to pay its short-term debts. European markets declined in morning trading, while Asian markets mostly ended with gains. Japan's benchmark Nikkei index popped up by 1%.